Unopened 1987 Topps Tiffany set. Looking to add a little flair to your collection? How about some gloss? Literally! While collectors have added standard-issued base and traded baseball sets to their archives for decades, a comparative few have collected their more limited glossy sheen parallels, issued by the major card manufacturers in the 1980s. Recently we at Collector's World were reminded of the hobby significance of Fleer "Glossy" and Topps "Tiffany" cards after picking up a sizable run in a pristine dealer lot we acquired, which included several 1985 Roger Clemens Rookie Cards. 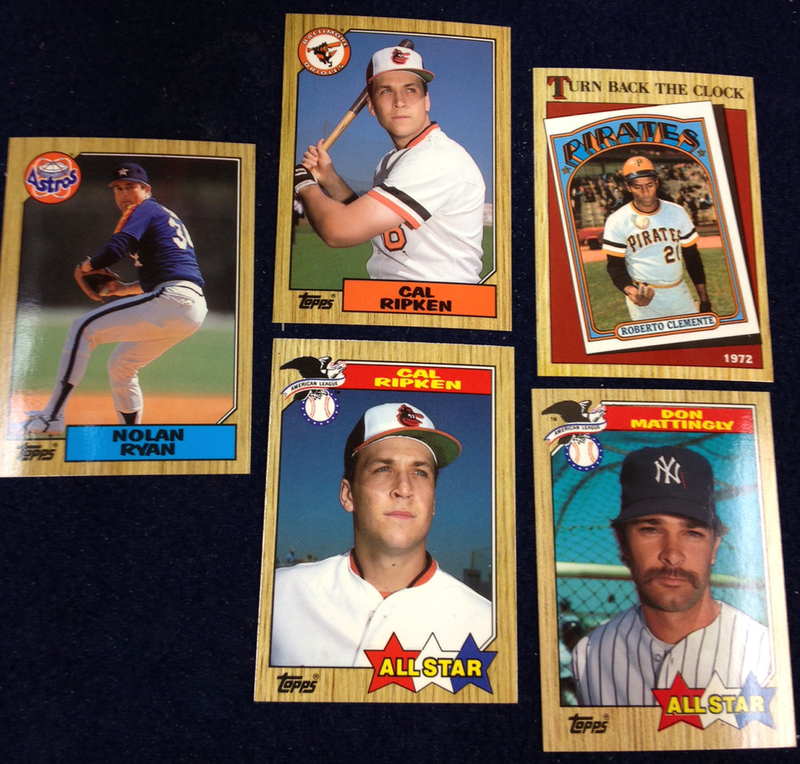 Sample Cards: Ryan, Ripken (2), Clemente, Mattingly. Distinguished by their glossy finish, collectors recognize their relative scarcity and the fact that many of these sets were only offered to hobby shop owners and dealers, with only a handful attainable through direct ads in trade publications. These cards rose in popularity as professional grading exploded in the late 1990s. Collectors became more aware of their appeal and accepted them as something more than just an oddball card or yet another parallel gimmick. Arguably the most prominent glossy sets come from Topps, who produced what came to be known later as "Topps Tiffany Baseball", produced between 1984 and 1991. Topps made a relatively modest number of factory sets that came with better production values, including print runs of only 5,000 in 1985 (Clemens) and 1986 (Bonds – Update). Secondary values of Topps Tiffany cards are stronger than their regular Topps counterparts. The glossy parallel sets Fleer produced for their 1987-89 baseball sets (similar to the Topps Tiffany sets) spiked in popularity, partly because the sets came in crisp, vibrant tin containers. In particular the 1989 glossy set—the final glossy issue for Fleer—commands more of a premium than its regular issue cousin because the print run is said to be only 5,000 and sports the Ken Griffey Jr. Rookie Card, regarded as one of the more important parallels of the hobby era. So, how do you tell the difference between a regular issue and its glossy parallel? Topps Tiffany cards are instantly recognizable in-person because of their white card stock. Regular Topps cards from the era traditionally used a grey stock. Card fronts also have a glossy finish, giving them a slick feel. Fleer, Bowman, and Score cards all feature a discernable shiny, slick feel that reflect light on the card fronts when compared with the regular card stock. With the massive print runs of base sets from the 1980s and early 90s, Glossy parallels are a meaningful alternative for those looking for a more unique collectible of your favorite player, team, or set from an era characterized by mass production.